It's been a long time since I have been impressed this much, Red Rooster succeeded. 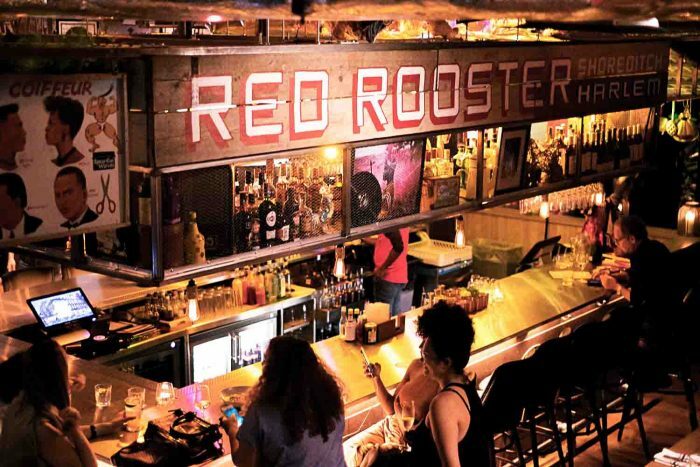 Located at The Curtain, the new kid in the members club block, Red Rooster Shoreditch is the baby boy from the original Rooster in Harlem, NY. Expect the unexpected from this place. Imagine Southern American food and then mix it with NY vibe, then add European style to the mix. The result is uncanny. Also, if you are into fashion and American Culture, this will be your mecca. Louis Vuitton themed doors, lots of references to american hip-hop and basketball and live-music while wining and dining. Am I dreaming? For starters we had deviled Eggs filled with chicken skin aioli and duck jerky (I mean, HELLO!?) and a Southern Heritage salad, which had seared watermelon, heirloom tomato and burrata (an excellent mix, if you ask me). My mouth is watering again just remembering our meal. Do not waste your time and head there ASAP! WHEN? Here comes the best part open daily til after midnight! Again, am I dreaming?! Monday-Tuesday from 5pm-12pm, Wednesday til 1am and Thurs-Fri until 2am! HOOOORRAY!